Healthy eating can be easy and delicious. Here are 10 simple ways to dramatically boost the nutrition and flavor of your dishes in less than 10 seconds. 1. Add 1-2 TBS of toasted wheat germ or shelled hemp seeds (hemp kernels) to your morning cereal, oatmeal, yogurt or smoothies. Both have a slightly sweet, yet nutty flavor and are loaded with nutrition including minerals, vitamin E, fiber, protein, omega 3 fats and folate. 2. Sprinkle cinnamon in or on your morning coffee, cereal, yogurt, oatmeal or toast. This sweet spice improves the metabolism of glucose and cholesterol, which translates to protection from type-2 diabetes and heart disease. 4. Throw some capers into your salads, sandwiches, pasta, or chicken dishes. Capers are the flower buds from a small bush common to the Mediterranean regions and they are exploding with potent plant antioxidants called flavonoids. Flavenoids are workhorses in the body for cancer and cardiovascular protection and measure for measure capers have more flavenoids than any other food. 5. Add prepared fresh salsa to your eggs, veggies, pastas or poultry dishes for an instantaneous boost in lycopene, vitamin C, potassium and fiber. Most grocery stores now carry ready-made cartons of “fresh salsa” in the refrigerator sections. And every ingredient in salsa is 100% healthy! 7. Go nuts! Throw a small handful (about 1 oz.) of nuts (any that suit your palate) into salads, soups, sauces or other prepared dishes. These delectable morsels of good health score a perfect 10 when it comes to a heart-healthy performance. Of nuts’ 8 nutritional attributes, 7 provide specific cardiovascular benefits. It’s no surprise then that several large and powerful studies report that eating about an ounce of nuts 5 days a week can reduce your risk of death from heart disease by a whopping 30-55%! 8. Add 1 to 2 heaping tablespoons of canned 100% pumpkin to your yogurt, oatmeal, or smoothies. This convenient and inexpensive food is one of the most nutrient-packed available to you. Low in calories, high in fiber, and home to the most concentrated package of disease-busting carotenoids known, canned pumpkin is an underutilized superstar food. Carotenoids play a central role in the health of your heart, eyes, skin and immune system. 9. Add pesto to your sandwiches, sauces and pastas. Decadently delicious and nothing but 100% pure heart-healthy ingredients – fresh basil, parmesan cheese, pine nuts, garlic and olive oil – I eat it regularly and know my cardiovascular system is thankful. Conveniently, prepared pesto is available at most grocery outlets. 10. Throw some berries (frozen just as healthy as fresh) into your pancake mix, smoothies, yogurt, cereals, and oatmeal. 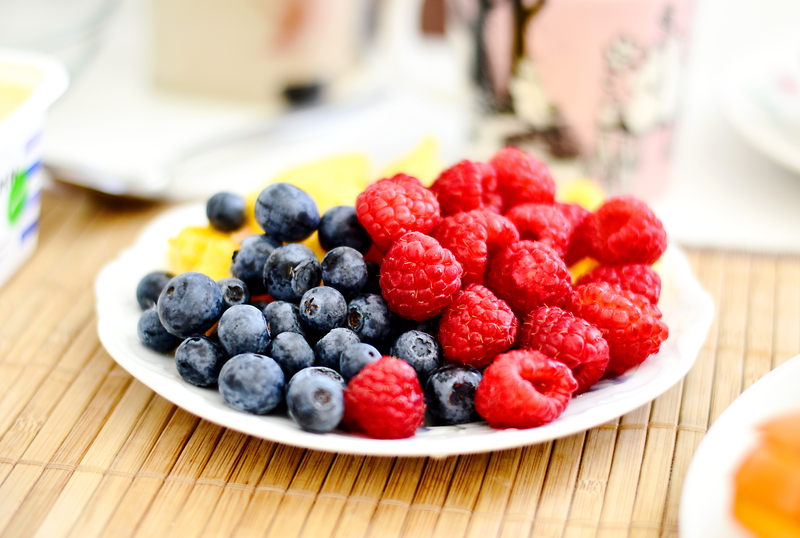 Berries are my top-rated fruit – loaded with fiber, vitamin C, folic acid and super-potent antioxidants. If you knew what I knew about them, I’m sure you would do as I do and include them in your diet daily!